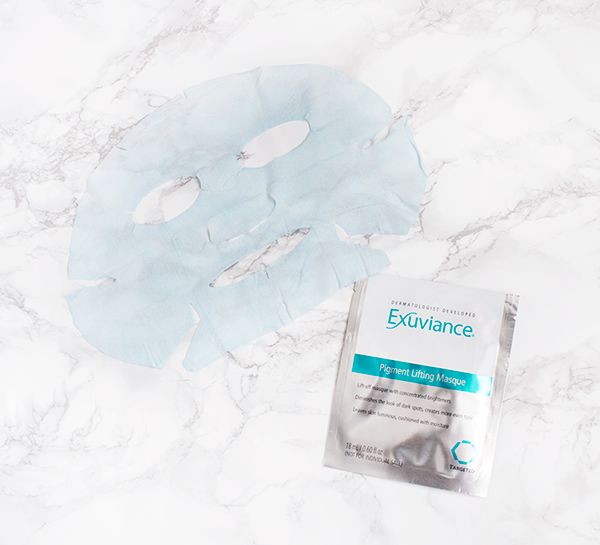 Based on all the products I've tried, I've had a really positive experience with the Exuviance skincare brand in general.Their Firm-NG6 Non-Acid Peel was the last product I used and I thought it was both innovative and effective. Read my full review. 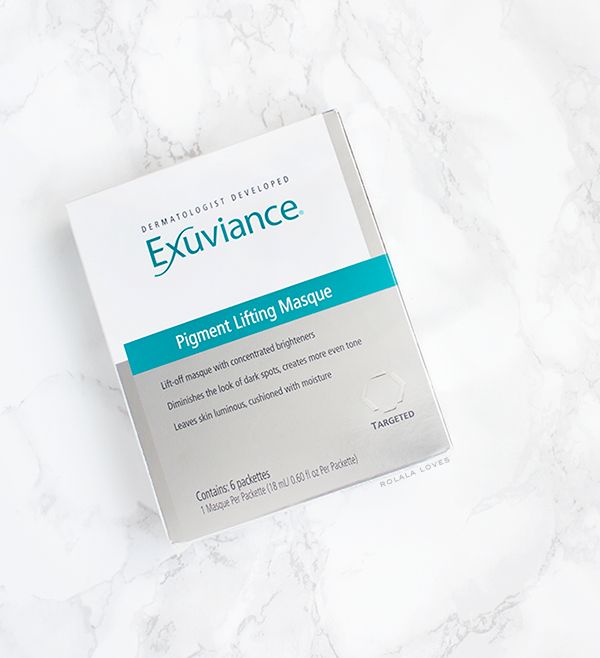 I was really excited when I heard about the Exuviance Pigment Lifting Masque since I'm a big fan of sheet masks and brightening skin care and this product combines both. I had to try it of course! About the Brand: Exuviance was created by Doctors Van Scott and Yu, widely recognized as leaders in the field of cosmetic dermatology. They discovered the anti-aging benefits of Glycolic Acid and created and patented the first Glycolic Peel. Exuviance has continued to develop many new patented anti-aging ingredients backed by evidence from numerous scientific and clinical studies. Recognized around the world, Exuviance formulas are expertly developed to visibly transform skin by combining their patented innovations with the best, state of the art technologies available in dermatology today. Product Claims: Exuviance Pigment Lifting Masque is a paper masque formulated with concentrated brighteners to diminish the look of existing dark spots and help prevent the formation of new spots. Specifically designed to adjust to fit any face, the masque adheres to skin to lock in the active-rich formula. Key Ingredients: Patented NeoGlucosamine to exfoliate skin and help break up existing dark spots, creating more even pigment. Vitamin C to speed the brightening process by helping to diminish the look of existing dark spots and preventing the formation of new spots. Packaging: Each masque is individually sealed inside a foil packette. How To Use: These masques are single use. After cleansing, place masque over the entire face, gently smoothing the fabric onto skin. Leave the masque on for 10 minutes allowing skin to absorb the potent brighteners. After 10 minutes, remove and discard the masque, massaging excess solution into the skin. Follow with a moisturizer. My Thoughts: I used these masques as I would any other sheet masks, in the evening following a double cleanse of my face and a quick splash of essence. This is a paper masque but it's decently substantial and doesn't feel flimsy. The overall size of it and the cutouts were a pretty good fit for my face. Where it started falling short for me was how dry the masque was out of the package. I don't need my sheet masks to be soaking wet but this masque started out feeling half dry. With the first one I used, I had to basically lay still for the duration of 10 minutes that I was supposed to leave it on for because it wouldn't stay on my face otherwise. And when the time was up, the masque had pretty much dried out. I almost scoffed at the directions that mention massaging any excess solution into the skin because there was none. On the positive side, my face did look smoother, plumper and brighter which was confirmed by my husband who sat next to me as I groused about the dryness of the masque while I had it on. I don't know if the first masque I tried was just bad but the second one wasn't as dry. There still wasn't an enormous amount of solution but at least it didn't start out feeling half dry. And the third one was the same. 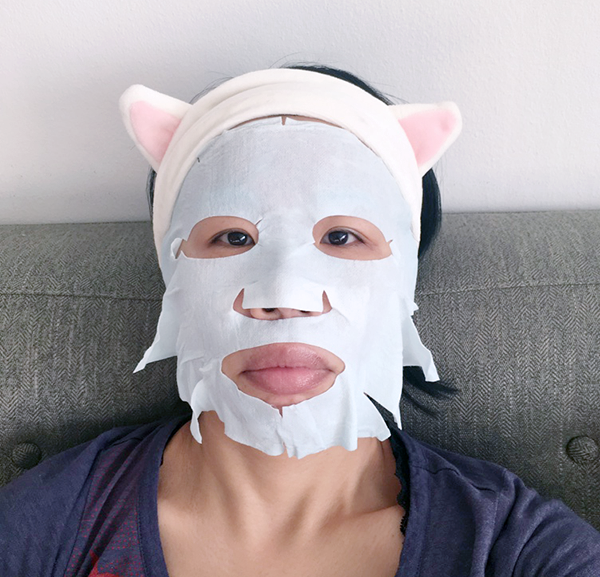 I do like the visible results it offers but I would like the actual masque more if it contained more solution and adhered better to my face because half the experience of a sheet mask is when it's on your face. This one felt a little prohibitive in terms of being able to move freely because I had concerns it would fall off and the edges never stay in place. I took to tucking in the top edges into my headband to secure it which is something I've never had to do with any of my other sheet masks. This masque has a slight scent but it's barely discernible and I quickly forgot about it. I experienced no sensitivity or irritation while using it. The active ingredients in this masque are really good and work well but they need to be more generous with it so that these masques actually feel like a luxurious experience especially for the price. In my opinion, a good sheet mask stays nice and moist starting from when you take it out to when you remove it. This means it should adhere well while keeping one's face hydrated and actively taking in the goodness of the essences. Exuviance Pigment Lifting Masque is available for sale through the Neostrata website as well as Ulta and Beauty.com. Do you use sheet masks? Any favorites? This is currently my favorite sheet mask. Disclosure: This product was provided to me for review through Brandbacker. There was no other compensation and all opinions and words are my own. Even though you mentioned you need it because the mask didn't stick (which is disappointing in a sheet mask) your headband just looks too cute! Thanks for this detailed review, Rowena:) I don't really use sheet masks, but I've always wanted to try them! I do not like the mask that do not adhere to the face is so difficult to know if the skin is getting all the benefit it states it offers. Cool headband. That sounds disappointing. I've never used a sheet mask that was so expensive and so dry. It's good the results were still there! My favorites lately are the Whamisa organic flowers and aloe and the Soyedodam Organic Hydrogel Sheet Mask. I don't actually like the feeling of them but I like the results a lot. Thanks for your honest review Rowena!!! I really love your beauty reviews, Rowena! They are always so informative and spot on - it's great to read about your hands-on experience. I've never tried sheet masks, maybe I should give them a try. glad to hear your review, even if it's not your fave. love the headband! Them kitty ears tho...! :-D Thanks for the review, very thorough, as always! Hmm, for that price the masks better be soaked and dripping with solution. Good that it gave you results but I doubt I will ever spend that much for sheet masks. I probably wouldn't use this. Though I don't really use masks in general. Thanks for the review dear! i do love sheet masks and i just pick some up from a local store here. i don't use them often though - just whenever i am around that part of the neighborhood and if i end up going into that store, i'll buy a few. :) i love your kitty head band btw! I can't get over your headband, Rowena. So cute and seems to wrap around pretty comfortbly. I started using sheet masks that I got from my trip last year (Japanese and Korean brands) and love the feel. This brand sounds very interesting, certainly want to try as I have some dark spots and yes to immediate and visible result. Thank you for a review. Your idea of eating the fruit by itself is certainly much health. Sometimes I feel that way with peaches, they taste much better fresh than baked in a pie. I just adore all of your product reviews. I've been hesitant to try these sheet masque for awhile. But I love learning more about them through you. Love that photo as well girl. You should have a glass of champagne while enjoying your spa like time :). I use Sephora's fiber masks and they are anything but dry. They are also more affordable than this brand, so for now I will stick with them. Maybe that first masque was accidentaly half dry...if the other two were fine, then maybe that first one just came with a flaw. In any case, it is great that you and your husband saw the positive effect on your face immediately, which surely makes it a good product. I would say this one is worth a shot! I didn't hear about this company prior to your review, but it seems like they're on to something. I'd be interested to try one of these, though I'd get bored if I had to sit still if they don't stay on. It's a pity they didn't have more solution on, sounds like they need it. First off this picture is great and gave me a much needed smile today. And yes it does not looks if it is staying on too well. I have never used a sheet mask. This sounds like something I need for the pigmentation on my cheeks. Great review! Hello Rowena, honestly I have not yet tried a mask like this, but you've encouraged me with your review, I'll look for some such in my city, taking into account the recommendations you've given, I hope to get a better result! i bought a few sheet masks from sephora a while back, they were very moist. but i gotta say, the mask scares me, haha! every time i looked in the mirror, it was creepy. but i am open to anything that would help with pigmentation on my face. I'm happy your face looks smoother and brighter. I'm yet to try a sheet mask. good to know about this product. Thanks for your share . I like your article. And usually those masks are loaded with product! How disappointing. Maybe enough people will complain and they will listen.